Whether it’s a mud knife or any other drywall taping tools which you require to get the job done, we pride ourselves on being able to offer the very best equipment on the market. From the 200mm OX Pro Taping Knife to the 50mm Pro Joint Knife, shop with SGS today to find the tool that’s right for you. If you’re facing that age-old dilemma of joint knife vs taping knife, rest assured that we have a good selection of both for you to choose from, all of which come in different sizes with the same quality grips (which are incredibly important for any tool). If you need a top-class taping knife or the most effective jointing tools, we’ve got the selection for you. OX Tools are renowned for producing dependable, hand tools which are suited to both tradespeople and DIY enthusiasts alike. 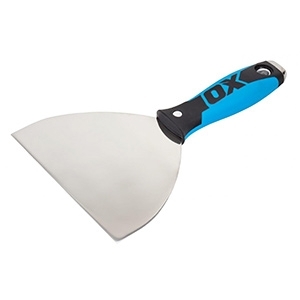 Operating under their OX brand in the UK, they supply a wide range of hand-held tools which have been developed over the years for maximum comfort and durability, and their taping knife is no exception. In this category, you can find the humble taping knife and joint knife, both of which have become a staple amongst tradespeople of all industries. Keep in mind that we offer a 60 day returns policy. If you have any questions, please don’t hesitate to contact our sales team.